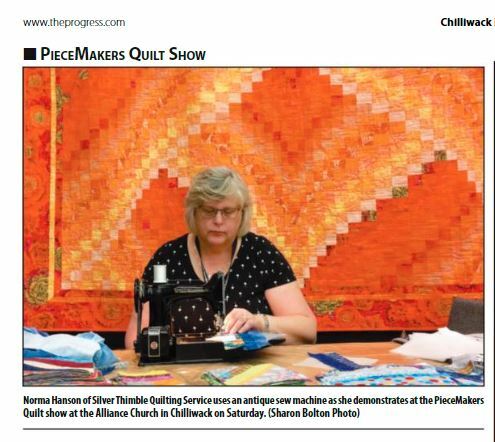 While doing my string quilt demo at our local quilt show, I was asked a number of questions by the public as they passed by. One woman in particular stopped and had a number of questions–my little featherweight – Charlotte – had caught her attention. After speaking to me for quite some time she told me that her husband worked for the local paper and he had told her to get some pictures of people looking at the quilts in the quilt show. She said she had so enjoyed our conversation that she made a decision to take my picture instead. And here you have it! This was a nice surprise to see it actually made the paper. This was a nice little bit of promotion for our guild’s show.